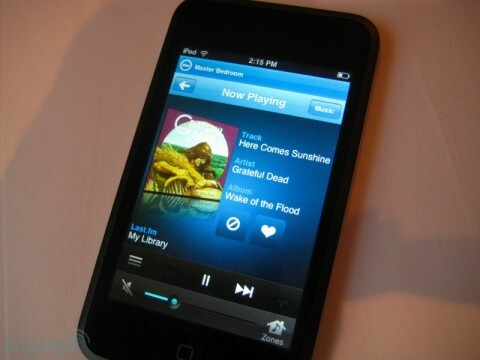 choice and a Sonos Controller for iPhone or iPod touch in hand, you can find and play the music you want by simply picking a room, picking a song and hitting play. You can play the same song in every room in synchronization, or play different songs in every room. Sonos’ system lets users quickly link and unlink rooms, without interrupting music playback. You can select, play, pause, and skip music in any room. You can search for your favorite artists and songs by typing on the touch screen. You can browse your collection by pointing and flicking and change the volume in a single room, or in all your rooms at once, all from the Sonos Controller for iPhone. The software alsp offers direct access to a world of music including Last.fm, Napster, Pandora, Rhapsody, SIRIUS Internet Radio, 15,000 plus radio stations, shows and more. Sonos doesn’t require you to have your computer on or a piece of server software on the network to play music all over the home. The Sonos Controller for iPhone requires an iPhone or iPod touch and at least one Sonos ZonePlayer ZP90 Add-On Player to operate, using your existing home WiFi network to communicate to the Sonos BU250 Multiroom Music System .